Goblin Lake’s appeal, apart from its Tolkien-esque name, is that it is remote and difficult to get to. We met other hikers who had turned back because of ‘impassible’ terrain, which only made it that much sweeter when we did emerge from the forest to set our eyes on this magical, pristine lake. 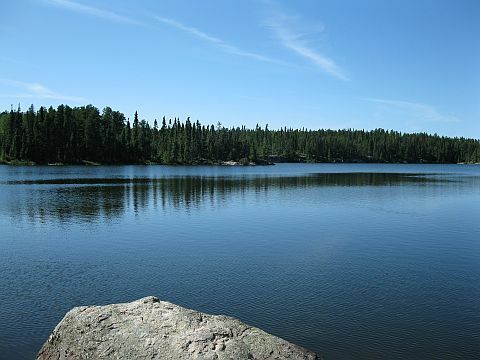 All Canadian Shield lakes have the same kind of fit-for-a-postcard beauty, the same majestic rocks and evergreens, and Goblin lake was no different in that respect. But what was so striking about it was that there was zero evidence of people. None of the ubiquitous docks, cottages, motorboats, wakes, radios or concession stands that also characterize the Ontario camping experience. Goblin lake was utterly still and peaceful, probably not unlike how it looked thousands of years ago, before an ambitious breed of lanky apes arrived from across the oceans to build causeways and cabins. To the three bewildered apes in our party, it looked like a relic from the distant past. We sat on a rock and stared, for a long time. Then we left, careful not to leave any trace that we were there. As we neared the campground, we knew we were a sorry sight. Exhausted, shoes soaked, bodies smeared with dead mosquitoes, we trudged back into civilization, proud of our conquest but yearning for the comforts of humankind. Civilization, as it turns out, calls me much more loudly and urgently than the wild. While we were out there in the depth of the forest, as perfect a scene as it was I knew we humans didn’t really belong there except as visitors. That realm belonged to other creatures: the deer, the rabbits, the goblins(?) and bears. Even though we’re clever and resilient mammals, if night had descended on us, we’d have been in serious trouble. The romantic notion of roughing it in the woods for a night becomes laughable when the temperature starts to drop, the forest grows pitch black, and the mosquitoes come out by the thousands. The bears may never arrive, but they’ll certainly never leave your thoughts. As a species we’re no longer cut out for the true wilderness, at least not without manmade equipment, most importantly the means to build fire. Domesticated by our own device, we don’t just prefer the cradle of civilization, we need it. One of my favorite stories is a Jack London short called To Build A Fire. It follows two characters on a lonely trek through the frozen Yukon: a nameless man, and his husky. Facing extreme temperatures, the man struggles through worsening conditions to light a fire and keep warm. He was a newcomer in the land, a chechaquo, and this was his first winter. The trouble with him was that he was without imagination. He was quick and alert in the things of life, but only in the things, and not in the significances. London foreshadows the man’s inevitable fate from the outset. He was too practical, too unsentimental, too confident to pay due respect to his own fragility in the face of nature. He was fully prepared to be cold and uncomfortable. He prided himself on his toughness and resolve, and assumed that should be enough. The act of building a fire becomes a symbol of human power over nature, but by the time he feels he needs it, the man’s frozen fingers can’t manage to build it. The dog looks on at the man’s fumbling, puzzled as to why this particular man doesn’t provide fire like all of the rest of them do. By the end of the trek I had one thing on my mind: getting back to camp to sit by the fire. Little discomforts — bug bites, wet socks, scrapes and bruises, hunger pangs — had accrued throughout the day, and I craved a campfire. Not for warmth or light or cooking, but for the simple, ancient comfort of sitting with friends around the fire, reflecting on the day’s adventures. Nothing speaks human civilization like the humble campfire. For over half a million years, people have been gathering around the fire to keep warm, cook food, illuminate the settlement, and deter predators. It’s become such a fixture in human culture that the campfire’s many utilitarian uses have led to deeper, more symbolic purposes. The fire represents safety and security. It promises a place to warm up, to escape the dark, to eat and tell stories. It brings people together. To sit around a fire with others is to share a certain intimacy with them. Fire is always the centerpiece of the camp, the beacon of comfort and safety. Everyone wants to be around the fire, to join the circle of orange, smiling faces. More than anything, the fire symbolizes humanity’s permanent departure from the animal world. In flesh and blood we’re still animals, but our affinity for fire and other tools simultaneously expands our power and erodes our ability to get along without them. A night in the wilderness without a fire would be miserable for a modern human being. Going without its heat or light would be bad enough, but much worse, there would be no sense of an established environment for humanity there. No illuminated circle that marks a safe place for people to be. The forest would feel so oppressive and alien. After a few wrong turns during our return trip, I couldn’t help but imagine that bleak scenario. It made me pick up my pace, and I began to fantasize about a nice evening by the fire. It felt so good to walk back into camp and drop myself beside the firepit. It was a beautiful night, just a little chilly. We told the stories of our adventures, laughed and ate and drank, and sometimes just stared. This is a repost of yesterday’s article. As you probably noticed, it wouldn’t stop refreshing. I tried a few things, and ended up just making a new post with the same content and deleting the old one. I apologize to the two readers who left comments, I wasn’t able to save them. I’m really late to the party, but didn’t want to miss reading one of your delicious posts. Anyhoo, great post yet again. The photo of Goblin Lake was such a treat! Gorgeous!! .-= Lori´s last blog ..Running Through Black =-. I’ve seen the movie too, and it is quite good. We watched it in Grade 9 English. We students were liking it, but the grim mood was spoiled when he put his boot through the ice and said “Oooh that makes me mad!” The class erupted in laughter and we kept saying that to each other all year. I’m a huge, huge, HUGE Jack London fan, both for the writing and the radical tendencies. Besides To Build A Fire, I think the Abysmal Brute is the best thing he wrote. Fantastic boxing story. When you don’t post often enough, “Ooooh that makes me mad” is what goes through my own head. Great, great post. The melding of your mind with good old Jack’s is a treat. .-= Josh Hanagarne´s last blog ..Help Wanted: Donate Books To People Who Don’t Have Them =-. I never explored Jack London any further. I do love the way To Build a Fire was written though. Man, how am I ever going to read all these books I want to read? I guess I should be grateful that there is such an abundance of stuff worth reading. What a wonderful post – and I love that quote from London! (Do get his books!) You are so right about the “hominess” of a campfire. Maybe because we are the only species capable of making one? Just pondering here. It is so unfortunate that we have become so industrialized and mechanized, that to survive in the wilderness would mean certain death for the majority of the population. I’m always surprised at the number of people I know who absolutely abhor the idea of camping! We camped on our honeymoon – people thought we were insane! Well if it should ever come to “it”, we’d be among the survivors! .-= suzen´s last blog ..Optimizing Life: Body, Mind and Spirit =-. That’s a great point, fire is certainly more “us” than it is any other animal. During the apocalypse, we should meet up. Bring your folding chairs, I’ll bring roasting sticks. 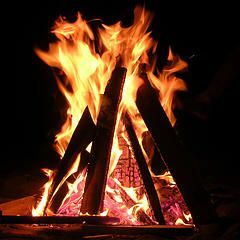 Speaking of fire, there was a pretty good post (let’s see… here it is: http://www.salon.com/mwt/food/eat_drink/2009/07/29/catching_fire/index.html) making the connection between fire, cooked food, and the origins of mankind. A great read, and fits in with your theme. Hi Angus. That sounds interesting but the link is broken! That’s just beautiful. Having recently experienced an extended power outage,hence no heat, I too was reminded of how fragile we humans are against magnificent Mother Nature. Despite having no shower, eating cold food, and watching the house become an excellent example of “chaos!”; the thing that I longed for most was a good Fire. I found myself daydreaming of breaking up little branches and flicking my lighter under them. Episodes of “Man vs Wild” ran thru my mind. (yes, thanks to Bear Gryll I DO know how to start a fire in the snow) As I gazed at the tree fallen in our yard, at first I didn’t think of the clean-up or wow, I’m glad it didn’t fall on this or that. I just thought, “Firewood”. You also expressed beautifully the bond you feel with others when you gather around a fire together. I don’t care who it is. It’s like magic. You can just feel the ancientness of the moment you are in. For families and ones you love, it can be healing in many ways. I love this post and I AM getting a fireplace. Thanks for sharing, David. I wish you many nights with your orange, smiling face :-)and your toes pointed to the Fire. Thanks! I wish you many nights spent around fires too. Just this saturday I went camping with some of my new Kiwi friends. We set up a fire on the beach, and sat around it and ate and chatted. Around eleven o’clock, the tide started lapping at the edge of the fire (the campground requires you to build fires below the high water mark). So half the people had to keep lifting their legs up each time a big wave broke, and eventually the tide took the fire away. It was cool and made me think of this post.